We are very pleased to launch the trial of the Royal Mail Partially Addressed Mail™ service. Royal Mail are aiming to start accepting customer postings from as early as 8 November 2018 and are introducing the service with a great introductory offer of up to 4p per item discount off the advertising price. Royal Mail have tested the service with a small number of customers. In doing so they compared the return on investment (ROI) achieved when sending advertising mail to targeted addresses with that achieved when sending mail to targeted individuals. Initial results show that once you take into account the lower price of purchasing data and postage, the ROI is just slightly lower when sending mail to targeted addresses. They believe the ROI can improve through testing and learning. Partially Addressed Mail is for advertisers prospecting to new customers. It enables targeted mail marketing without the use of personal data about recipients. It does so, by targeting households using geo-demographics at postcode level (c.15 households). Instead of addressing a mailing item to an individual prospective customer, the mail item will be addressed to the household. Customers need to exclude existing customers from the Partially Addressed Mail posting and ensure that the mailing items contain no personal information. This is very important. To produce a Partially Addressed Mail posting, customers may use PAF data, excluding all personal data (i.e. Roberts’ household) and any single household postcodes, and a geo-demographic solution (for example, CAMEO or MOSAIC). How does it compare with fully addressed Advertising Mail? 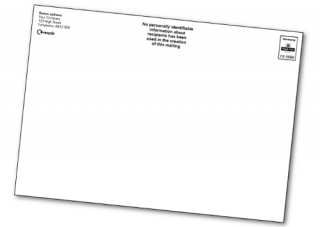 Lower postage costs – We appreciate that when using Partially Addressed, response rates may not be as high as advertisers would receive from personalized, cold list mailings. Therefore, we have set the prices of the Partially Addressed Mail service lower than the Advertising Mail service. It is 4p per item less for letters and 2p per item less for large letters. Significantly reduced data costs – As you do not need to purchase personal data, you can typically save up to 5-10p/item on average over a cold list mailing. Estimated 30% more reach – For the same budget spend, you can communicate with 30% more households in one mailing than with a personalised, cold list mailing. Minimum 10,000 items per mailing and requirement to mail all households within each targeted postcode removing personal addresses, existing customers and suppressed customers.